3-story structure which served as headquarters of Hamas intelligence destroyed in IDF retaliation for rocket attack. The IDF attacked the ‘secret headquarters’ of the Hamas terrorist organization in Gaza in retaliation for the launch of a rocket that injured seven people in the town of MIshmeret in central Israel. 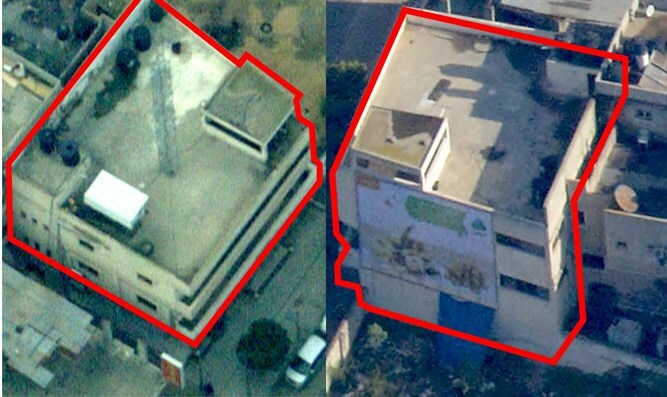 The headquarters was located in a three-story building in the Tzabra neighborhood in the Gaza Strip. The IDF said that the structure served as a secret headquarters of the Hamas terrorist organization, which served the general security, general intelligence and military intelligence of the organization, and mentioned that the Hamas military intelligence department is responsible for intelligence gathering and research against the State of Israel. “This is a central governmental asset of the Hamas terror organization, which was attacked in parallel to the IDF attacks in the Gaza Strip.The attacks are carried out in response to the rocket fire this morning at Israeli territory. The Hamas terrorist organization bears responsibility for everything in and out of the Gaza Strip,” the army said. The IDF also said that it had attacked Hamas’ Interior Security Office in the Rimal neighborhood in the Gaza Strip. Earlier, the IDF announced that in view of the situation assessment and as part of upgraded preparedness measures, the Gaza Division decided to block areas and roads adjacent to the Gaza security fence. It was also decided to stop agricultural work in areas adjacent to the fence. Blocked areas and routes include Givat Kobi in Sderot, Giv’at HaPa’amonim, the Black Arrow site, Givat Nazemit, Lone Horseman Hill, Highway 4 from Yad Mordechai Junction to Netiv Ha’asara and Highway 25 from Sa’ad Junction to Kibbutz Nahal Oz. Additionally, all Gaza area authority departments were canceled this afternoon. Meanwhile, incendiary balloons continue to be launched from the Gaza Strip. At noon such balloons were located in Kiryat Gat near the railroad tracks. The IDF announced it would deploy reserves to Iron Dome batteries and Home Front Command, and transfer an armored brigade and infantry brigade to Gaza. First time in 1,000 years: Yom Kippur service on Temple Mount Now it can be told: Shortly after the Six Day War, Moshe Dayan allowed Priests to perform sacred service on the Temple Mount.